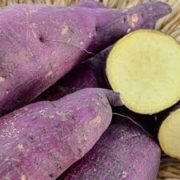 The Murasaki Purple Sweet Potato is a very delicious purple-skinned sweet potato with white flesh. This sweet potato variety is a Japanese sweet potato that offers very good yields and a delicious taste! PRE-ORDER seed potatoes for 2019 spring delivery. See shipping schedule below. Potatoes are an excellent carb source and culinary staple that can be added to roasts, stews or as an addition to a meal. They come in various colors and shapes, such as the traditional Yukon gold to purple fingerling potatoes. Before Planting: A day or two before planting, use a sharp, clean knife to slice the larger seed potatoes into two seeds. Each seed should be at least 1 1/2-2inches in size, and must contain at least 1 “eye” or bud. Smaller potatoes may be planted whole. Over the next couple days the cut side of the potato will form a thick callous over the cuts, which will help to prevent it from rotting once planted. Planting: Potatoes may be planted as soon as the ground can be worked in the early spring, but you must use good judgment. The soil should be evenly moist, but not wet or soggy. If the soil is water logged when you dig, not only will you risk “caking” the soil, your seed potatoes will probably rot before they even get started. Assume that you get on average 4 potato seeds per pound of potatoes. If you plant a seed potato, plant with the eye facing up in a trench dug 4 inches deep. For a 8 foot row, you will need 10 lbs; for a 25 foot row, 20 lbs; for a 50 foot row and for a 100 foot row, 40 lbs. Fertilizer: Potatoes crave nitrogen and phosphorous. 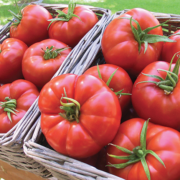 Prior to planting, non-organic gardeners can use a standard 15-15-15 fertilizer and work it into the soil’s surface. To aid in potato growth, side dress freshly sprouted seeds with a mix of cottonseed meal, bone meal and green meal to increase the soil’s acidity. You can also add in kelp meal. During the growing season, feed the plants with fish emulsion or kelp extract every two weeks until the plants bloom. Then, six weeks after planting, side dress the potatoes with the same fertilizer mix used at planting but only half as much. Days to Maturity: Potatoes are ready to harvest when the foliage begins to die back. Harvesting: Cut the brown foliage off and leave the potatoes for 10 to 14 more days. Dig up the potatoes on a dry day but handle them gently as they bruise easily. Once harvested, store the potatoes in a cool, dark place for two weeks to allow for the skin to cure. Curing the skin allows for the potatoes to keep longer. Once cured, do not store potatoes near apples, as the apples make the potatoes go bad. Tips: Once plants reach 6 inches tall but before they begin to flower, gardeners should start the hilling process. This helps prevent potato sunburn, which creates a chemical called solanine that turns the potato green. Solanine is toxic, so do not eat green potatoes. This process needs to be done every few weeks throughout the potato’s growing season. Sweet potatoes may appear similar to regular potatoes, but unlike regular potatoes which grow best in a cooler environment, sweet potatoes do better in the heat. 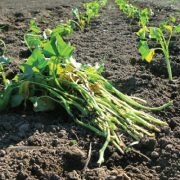 Before Planting: For those living in warm climates, plant sweet potatoes a month after the last spring frost, as soon as the temperatures outside and the soil temperatures have warmed up considerably. To obtain a sweet potato slip, cut a sweet potato in half lengthwise and bury each half in damp potting soil. 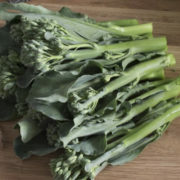 Keep the slips moist and warm, and shoots should sprout within a few days. Leaves will follow the shoots. 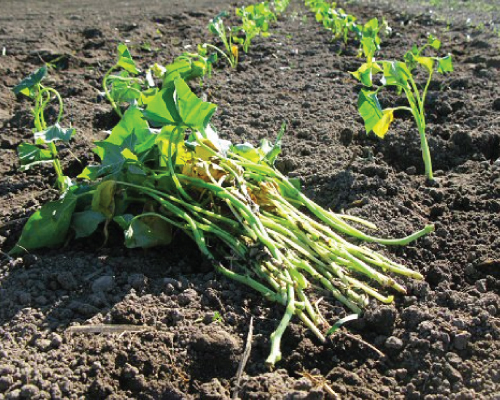 Planting: Shoots should be between 4 and 8 inches tall before they’re transplanted outside. When the shoots are old enough, transplant them outside. Since sweet potatoes like it warm, plant the transplants in raised rows, which are usually about 8 inches higher than ground level. Watering: Water your sweet potato plants weekly since a regular watering schedule will help prevent the sweet potato skin from splitting. Fertilizer: Add fertilizer containing potassium approximately two weeks after planting the slips. Days to Maturity: Tubers are ready to harvest when the plant’s foliage turns from green to yellow. Harvesting: The tubers will grow close to the surface, so dig gently when harvesting. If harvesting too roughly, the sweet potato skin will bruise. Tips: To avoid vines over growing , gently weed the vines two weeks after you’ve planted the slips. Avoid using a hoe so you don’t disrupt the feeder roots. 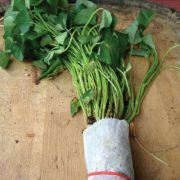 We ship sweet potato slips at just the right time for planting in your area. The map and chart below identify your growing zone and show you when your sweet potatoes will arrive. Please check this page for any updates closer to your shipping date.